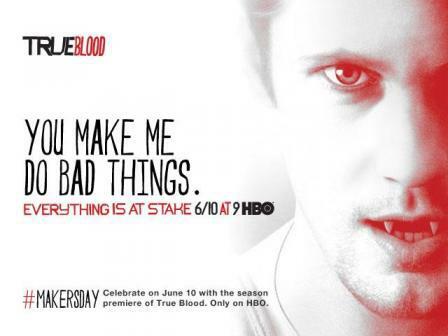 HBO’s countdown to the new season of True Blood is now in full swing. Following on from Carrie Preston’s 1 week to go ditty, we believe yesterday saw Chris Bauer introduce us to 6 days to go (although video evidence still escapes us), and today we have Joe Manganiello reminding everyone that there is 5 days until Season 5. Just be thankful he’s not wearing his fireman stripper uniform! And if there’s 5 days until the new season that means there’s 5 days until viking time, 5 freaking days, and some of us are getting a little too overexcited about seeing the vampire god again. Don’t worry, I’ve got my therapy booked and I promise I will take my medication later but in the meantime how about a little bit of this and that to get us in the True Blood mood. Did I mention there are only 5 days until Season 5 and I’m slightly excited?